Dr. N. Ramamoorthy, Retired as Associate Director (International Collaboration & Technical Coordination), BARC, Department of Atomic Energy (DAE). The Nuclear Suppliers Group (NSG) came into being following India’s peaceful nuclear experiment (PNE) performed in May 1974. Since their first meeting in November 1975, during the next four years, the group held a series of meetings under different nomenclatures (for example, “London Club” “London Group” and “London Suppliers Group”). There was a long gap thereafter, and they met again only in 1991. 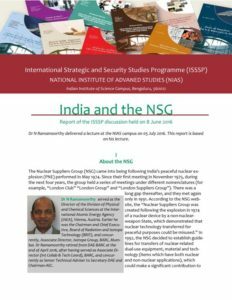 India prepared a huge document (330 pages) for its application to the NSG and submitted it in May 2016 explaining its qualification and eligibility to be included in the NSG. The NSG preparatory meeting for annual plenary planning was held in Vienna during 9-10 June 2016, and the NSG Annual plenary was held in Seoul, during 23-24 June 2016. The latter meeting discussed, despite certain opposition, India’s case for entry into the NSG. On India’s membership to the NSG, there is currently more uncertainty, than probability or feasibility. China is likely to remain as a main factor in determining India’s entry. Outside China, the US Presidency change later this year may have an impact on this process. While it is difficult to predict, it would be a pleasant and welcome surprise, if India is admitted as PG in NSG later this year.